This has a LOT of photos. I was fortunate enough to visit the beach again on Good Friday. It was fairly warm, but there was still a great deal of ice out there.I was also happy to see how much snow there is on the mountains! 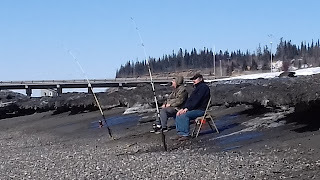 Even fishermen were out. These nice men said I could take their photo. They were hoping to catch some halibut. You can see the ice on the shore behind them From there you needed to jump down to get to the beach. I took a great many ice on the shore photos. They were full of rocks and sand and dripping water. Powerful pieces of winter waiting to melt into spring. On the way back to the car, I found out the best footwear to use when walking on the beach are rubber boots. It is much less stressful to wade in the waves instead of dodging them. Although, dodging them IS fun!!! I had to take a photo of this white thing...it is a seashell! A clam half with a bit more. You rarely find shells on this beach! I was at the one down by the Tesoro docks. No ship today. just lots of sunshine and beautiful rocks. I wasn't going to bring any home. I managed to stop at 3.